It's not perfect, but it's done. I'm reminding myself that I can knit another one, and having this gift checked off my list is more important right now! Weaving in all the ends and washing this tonight, then getting it wrapped up for Mom. Pattern: Rachael's ISBN Hot Water Bottle Cozy by Rachael Herron, modified to use stranded colorwork instead of the cable panel and with a shorter neck. 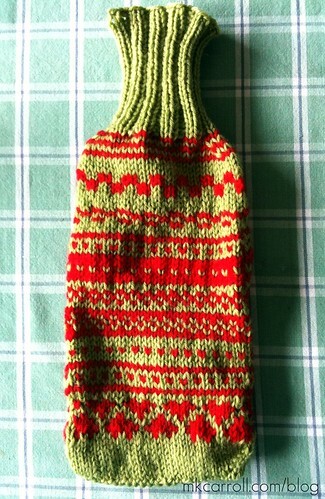 The heart band at the bottom is from the chart in the Hearty-stripy sock pattern by Patty McEldowney.